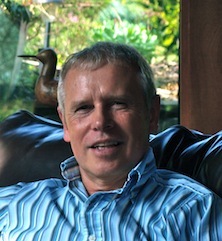 Welcome to the five hundred and fifty-first of my blog interviews with novelists, poets, short story authors, biographers, agents, publishers and more. Today’s is with author of science fantasy and urban fantasy for children and thrillers Rhys A Jones aka R.A. Jones. A list of interviewees (blogged and scheduled) can be found here. If you like what you read, please do go and investigate further. Morgen: Hello, RA. Please tell us something about yourself, where you’re based, and how you came to be a writer. RA: I’m male, 56, live in Carmarthenshire in West Wales. I’m a doctor of medicine by profession. Always had a burning desire to write, suppressed by all it takes to become a surgeon until I was perhaps 33. Started writing then – have done ever since. Morgen: Life does have a habit of being consuming but congratulations for pushing it aside enough while still ‘young’ (I was 39). What genre do you generally write and have you considered other genres? RA: Now, I write science fantasy and urban fantasy for children mainly–but with a couple of adult MSS on the back burner. Previously, as Dylan Jones, I wrote gritty thrillers. RA: As Dylan Jones, 4 adult thrillers–with Random House / Corgi. As RA Jones 2 children’s / YA with Lucky Bat Books. Morgen: You’ve also self-published, what lead to you going your own way? RA: I’m self-publishing the children’s stuff. Needed a new name / fresh start. Finally gave up on trying the normal submission route when an Editor from Hodder and Stoughton told me they loved the book (the Obsidian Pebble) but that their list was only doing YA vampire books for the foreseeable future. Life’s too short. Morgen: Ouch (and dare I say very single-minded of them). Are your books available as eBooks? How involved were you in that process? Do you read eBooks or is it paper all the way? RA: Yes–Random House have started to release the thrillers as Ebooks at last (10 years later). The MG/YA books are ebooks, with one series ebook only, the other ebook and POD. Very involved with the ebook–but Lucky bat do all the heavy lifting. I have a kindle and I use it — 50/50. Morgen: “heavy lifting”, I love that. Do you have a favourite of your books or characters? If any of your books were made into films, who would you have as the leading actor/s? RA: Two of my thrillers were made into TV films–Jonathan Pryce took the lead role in Thicker Than Water. Danielle Nardini was the lead in Outside The Rules. Morgen: With Jonathan Pryce playing a lead role previously, I’d say “let’s hope she is reading this”. 🙂 Did you have any say in the titles / covers of your books? How important do you think they are? RA: I was always asked to approve the paperback covers. With the RA Jones books–I’m very hands on—initial ideas to the artist and work develops from there. I think that they are very important as first impressions. Morgen: They are, absolutely, and yours are great (I’m not just saying that). What are you working on at the moment / next? RA: As mentioned, I have two series ongoing. 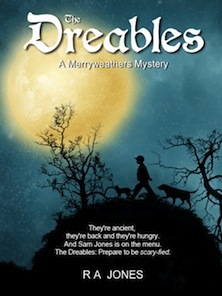 The second in the Artefact series–The Beast of Seabourne is in editing, the second of The Merryweathers Mysteries, The Curse of Borage-Doone has just come out as ebook only. Morgen: That’s OK. 🙂 Do you plot your stories or do you just get an idea and run with it? RA: Plot. The Artefact series is a quintet and so I have timelines and character arcs and plot threads on huge pieces of flip chart paper. Have to for that. But always I have a working detailed synopsis with a known ending–regardless of which book it is. Morgen: You’re one of a minority, most of us are ‘pantsers’ but writing series, you must have to be more structured. Do you have a method for creating your characters, their names and what do you think makes them believable? RA: Names are pretty random, and will often change from first draft to last. I tend to fall into the trap of using the same letter a lot, but I am aware of that. To make them believable–you need to engage the reader by giving the characters believable histories, qualities and personalities and let this drive the action. Morgen: I keep wanting to call all my characters Elliott, as a first or surname. 🙂 Do you do a lot of editing or do you find that as time goes on your writing is more fully-formed? RA: All first drafts are ***t. That’s not me, that’s Hemingway–but I tend to agree. And no, my writing is not more fully formed. But I know that the rewriting is what will knock it into shape and I have the confidence of knowing that now. Morgen: Absolutely, me too with mine. Do you have to do much research? RA: Yes. Hours online, trying to avoid the shiny little things that distract me. But the great thing about fantasy is that it is all made up! Nevertheless, where detail is needed, I do research it thoroughly. Morgen: And best to or someone will pick up on a flaw. What point of view do you find most to your liking: first person or third person? Have you ever tried second person? RA: I’m a limited third person viewpoint author. I love the intimacy and immediacy this gets you–especially for the age group I write for. Morgen: Oh do, it’s great fun and can be quite dark (although best kept for short pieces). Do you write any poetry, non-fiction or short stories? RA: No. I’m a fan of short stories though. MR James is one of my all time favourites as is Conan Doyle. Morgen: Both classics (literally). Do you have pieces of work that you think will never see light of day? RA: Lots. Do you have a WC that needs papering? Morgen: 🙂 My bathroom upstairs is tiled but I’ll let you know about the downstairs WC. 🙂 Have you had any rejections? If so, how do you deal with them? RA: Lots. I deal with them now by understanding that the industry is driven by zeitgeist. Bandwagon jumping is not a good idea and that you should be true to yourself. The great thing about self-publishing is that you soon get to know if what you’re doing is actually any good. Amazon and reviews in general are a pretty good barometer. For instance, I wanted to prove to myself that I could actually write for this age group and from what I’ve had back so far, it looks as if I can. So I am sticking to the road map and I have a long way to go to get a platform established and get more work out there. Morgen: I agree about reviews and that’s how I think authors will fare, although I know of two (one personally and one from a recent newspaper article who write their own… using their own names!). Do you enter competitions? Are there any you could recommend? RA: I haven’t yet, but I am considering this one this year: http://www.epicorg.com/competitions/epics-ebook-awards.html. Morgen: How funny, my interviewee yesterday, Sarah Ettritch, mentioned EPIC. 🙂 Do you have an agent? Do you think they’re vital to an author’s success? RA: No I do not. Not anymore. You still have to do almost everything yourself in terms of promo. Morgen: You do. I’ve only had one author say their publisher does all their marketing but she’s still active on Twitter and Facebook. It was announced that she’d recently sold her 1,000,000th book – I wonder if that’s down to either of both. How marketing do you do for your published works or indeed for yourself as a ‘brand’? RA: A lot. I have employed a few people to help get me established as a web presence. Fiverr is a great site for getting Squidoo lenses, SEO, Bookmarks etc, wordpress blogs etc (that’s what you do, right?). I know, but I couldn’t speak Internetese until a few months ago either. Morgen: It is, yes, although I have WordPress and Blogspot blogs, I’d recommend WP every time, and that’s all I design for other people. What’s your favourite / least favourite aspect of your writing life? Has anything surprised you? RA: Favourite part is reading something that my characters do that moves me. Always a surprise to learn that it works. Least favourite–the first page of the first draft and that ‘I must be bloody mad’ moment. Surprised me? Yes, when people say nice things about what I’m doing and actually get what I’m trying to say. Morgen: I love that too, especially when they take the trouble to email. What advice would you give aspiring writers? RA: Don’t think that you can just put any old rubbish out there. If you’re not part of a writing group, employ beta readers (ELANCE) and Editors. It costs money, but it will do two things. 1/ Tell you if you are actually any good at this. 2/ Make what you’ve written infinitely better. Morgen: And 3/ come up with some great other suggestions (which I suppose fits in to 2/ too). Is there a word, phrase or quote you like? RA: Ha. I walk the hills around us. I’m a dozen miles from the Brecon Beacon National Park and we have two dogs. ‘nuff said. Morgen: How lovely. I’m just round the corner from an old racecourse and get there as often as I do because of my dog. Are there any writing-related websites and / or books that you find useful? RA: The Creative Penn, kindle-for-kids, advancedfictionwriting. Morgen: Joanna Penn again. Sarah mentioned her site too. 🙂 Are you on any forums or networking sites? If so, how valuable do you find them? RA: Bookbloggers and Kindle forums. I subscribe but actually use them very rarely. Similarly, I have decided not to blog about writing. I think that you can spend a lot of time blogging to authors, not your audience. Morgen: You can but authors read too… or if they don’t, they should (pot, kettle, black – I don’t read nearly enough). What do you think the future holds for a writer? RA: Interesting times. My genre may be the last one that stays with paper as the target audience are disenfranchised when it comes to purchasing. But ebooks will need to offer more to attract readers. How and what, I am not sure yet. Morgen: A great time to be an author (despite the huge competition), I feel. Where can we find out about you and your writing? RA: No, but I will consider a second person viewpoint piece, promise. Morgen: Oh yes, please do. It’s an acquired taste but I’ve acquired it. 🙂 Thank you, RA. Update from R.A. since our interview took place: The Obsidian pebble has been taken off Amazon because I’ve signed a deal with a small press called Spencer Hill Books which will be re-releasing OP in October of next year, with the others in the series to follow. As I said in the interview, I just felt that there is a need to somehow get through to the gatekeepers — librarians / teachers / parents — to get your book known in middle grade because the target audience aren’t always the ones buying the books. I’ve also re branded as Rhys A Jones because of googlganger issues with another RA Jones. Having said that, I’ve just signed too for Spence City — the adult urban fantasy branch fo the Spencer Hill family and have a book coming out with them in Feb 2014 under the pseudonym DCFarmer. www.dcfarmer.com. 1/ We are relaunching the whole series including the Obsidian Pebble with a new publisher in October this year. 2/ I am now Rhys A Jones as opposed to R A Jones. Because of a couple of authors with similar names. Curse of googlegangers. 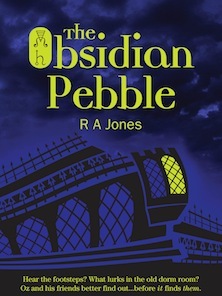 3/ The Obsidian Pebble has just won The Sharp Writ YA book of 2012 award. You sound so intelligent and interesting. Do you think your books were made into movies because you had a big name publisher? I have not seen a small press garner that type of success yet. Great interview and good luck on your new ventures. Thank you, Linda. I’ve passed on your comment. Lovely to hear from you, as always. Linda, when the thrillers were made into TV movies, the odd thing was that they were seen right from the off as likely movies and that helped get them published. All very odd, but maybe a reflection of the way I wrote them or my voice, whatever that is. So the fact that they were big publishers was incidental. That should give some hope to everyone. As for intelligence…hmmm. I always think of it like underwear. Important that you have some but best not to show it off. Thank you so much for your reply. I will remain hopeful. What does Rhys stand for? Old Welsh name. Lots of kings had the name. Originally meant spirited or enthusiastic.